So, how's my progress going on Spookytown? Let's say... slow. Only because I just don't have a lot of free time. Full time job, part time freelance, wife, new baby, etc. But I have made some progress and attached is the proof. I have the first 5 pages done. 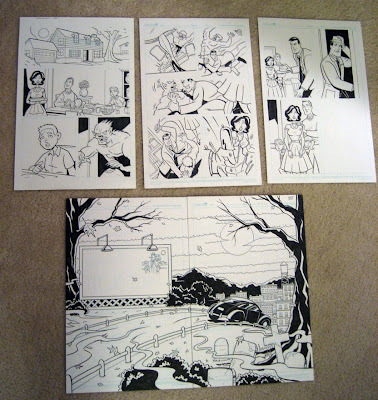 Pages 4 and 5 took a while because they're a big double page spread. So, I have been working on it. Also, one of my New Year's resolutions is to work on it everyday, not matter how little I do. I just have to get something down on paper. So far it's working for me. But it's only been 12 days, so we'll see how it goes. 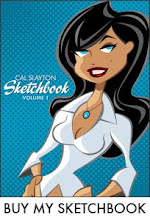 Also, if you're interested, I have still have some sketchbooks for sale. 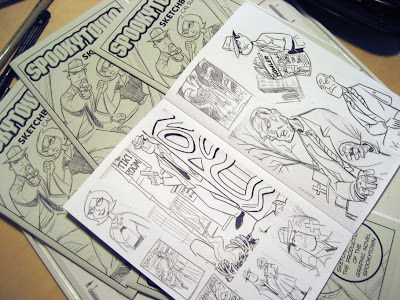 It’s a 20-page mini-comic type book containing over 70 sketches, drawings and doodles that I did while preparing to start the graphic novel. I printed up a limited edition of 100 books. Each is hand numbered and signed, I usually do a sketch on the back too. Just drop me a line if you'd like to buy one, they're just 5 bucks. Double page spread looks very nice.